NASA headquarters was already reviewing all publicity on climate change research, but the latest coverage would force it into even more severe action. The following week it laid out new restrictions on Jim’s ability to comment publicly, and the global GISS temperature record was temporarily taken off the internet. Prominent amongst those setting the new conditions was NASA’s new head of public affairs, appointed by George Bush’s administration, David Mould. His previous jobs included a senior media relations role at the Southern Company of Atlanta, the second largest holding company of coal-burning power stations in the US. Only one company had donated more to the Republican Party than the Southern Company during George Bush’s 2000 election campaign: Enron. No one was to take a direct call from the media without notifying the public affairs office, David and his coworkers ruled. They wanted to know everything Jim was doing or planned to do, and had to be notified well in advance of anything that might attract media attention. Everything posted on the GISS website needed approval, and all interview requests were to be forwarded to NASA headquarters. Within days, the measures thwarted a possible radio interview with Jim, and passed a newspaper request about 2005’s temperature to a scientist with no knowledge of the data. The justification for Jim’s response would come by chance during a mandatory NASA training session. Usually the refresher of NASA’s mission and values seemed a waste of time, but now the words seemed to bear extra weight. NASA’s stated mission was “to understand and protect our home planet”. Its core values included “integrity”. Jim wove these words into a memo urging his senior coworkers to fight the restrictions, and passed details of the situation to Andy Revkin at the New York Times. Though he had to work hard to get his editors to print such a sensitive story, it finally appeared on January 26, 2006. An investigation by the NASA investigator general would eventually confirm Jim’s story, blaming David Mould and other senior NASA public affairs officials. And though the investigation says that they acted independently, some believe the censorship went all the way to the top, to NASA’s administrator and the White House. Whoever was in fact responsible, two things are certain. First, NASA revised its mission statement, removing the phrase “understand and protect our home planet”. Second the NASA administrator subsequently cut the part of the NASA budget that provided most of the funding for GISS by 20%. The following year, environmentalist and writer Bill McKibben asked Jim for some information for his new website and campaign. He wanted to put the ‘safe’ level of CO2 in the atmosphere in its title, so could he confirm, is it definitely 450 ppm, or is it something else? At first Jim asked him to wait. “I was working on a paper that would specifically address the ‘dangerous’ level of CO2, and it was likely to be less,” Jim recalled. He’d previously got 450 ppm by looking across the whole of Earth’s history in papers and articles such as “How to Defuse the Global Warming Time Bomb” around the year 2000. One of many pieces of evidence in that research was that last time temperatures were 2-3°C higher than today, about three million years ago, sea levels were at least 25 metres higher. Today a billion people live within 25 metres of sea level, he noted. So with 2°C warming from today potentially disastrous, Jim went for an upper limit of 1°C warming from 2000, or 1.7°C from pre-industrial times. 450 ppm was the approximate level of CO2 in the air last time the world was that warm. However, Jim had been ignoring that 125,000 years ago temperatures were very similar to today, but sea levels 4-6 metres higher. He’d done this because he thought ice sheets could only change very slowly, but evidence was increasingly showing that assumption was wrong. Jim and his team therefore used GISS climate models to supplement limited historical climate data to look back to when Antarctica’s ice sheet formed, around 34 million years ago. They estimated that the CO2 level then was 450 ppm, plus or minus 100 ppm. This, for Jim and his team, was a strong warning that 450 ppm and 1.7°C was actually too risky. Instead they advised a 350 ppm/1°C target, which was below the 385 ppm measured level at the time of writing. “The most difficult task, phase-out over the next 20-25 years of coal use that does not capture CO2, is herculean,” they wrote, “yet feasible when compared with the efforts that went into World War II.” Accordingly, Bill’s organisation is now well-known as 350.org. Jim and colleagues’ projections on how we can reach the 350 ppm atmospheric CO2 levels they consider safe if fossil fuel emissions are reduced. (A) If 6% or 2% annual cut began in 2013 and 100 billion tonnes of carbon reforestation drawdown occurs in 2031–2080 (B) effect of delaying onset of emission reduction as we continue business as usual (BAU). 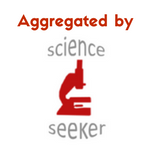 Image copyright PLOSone, from Hansen et al 2013, used under Creative Commons license, see link below. Jim’s advice to Bill came as he started trying harder to communicate the risks of climate change, motivated partly by his growing squad of grandchildren. He started sending out emails to a personal list of several hundred scientists, mischievously also adding in US state commissioners responsible for power plants. He gave two talks in London in July, 2007, arguing that new coal power stations should be stopped, by then seeing this as the only worthwhile commitment politicians can make. “When they tell you they are going to solve the problem via a ‘goal’, ‘binding target’ or ‘cap’ you know that they are lying,” he later wrote powerfully. When it looked like the UK, Germany, would join the US, India and China in expanding their use of coal, Jim wrote directly to the countries’ leaders. He called for them to suspend their plans, his open letter published in Germany getting him a meeting with the country’s minister for the environment, Sigmar Gabriel. Sadly Germany’s position was clear by the end of the meeting – it needed coal because it was phasing out nuclear power. Appearing at a 2007 Live Earth event in New Jersey, between music from Jon Bon Jovi and the Smashing Pumpkins, Jim found a more receptive audience. Together with grandchildren Connor and Sophie, he stressed how important it was for young people to wake older people up to the need to phase out coal. The whole audience was asked to commit to seven pledges, including fighting coal-burning power plants “without the capacity to safely trap and store CO2”. Though Jim agrees that carbon capture might allow coal power to continue, ultimately he thinks a full stop on coal will be more acceptable to most of us. “The public will never accept the large increases in electricity price that would come with large-scale carbon capture,” he later wrote. 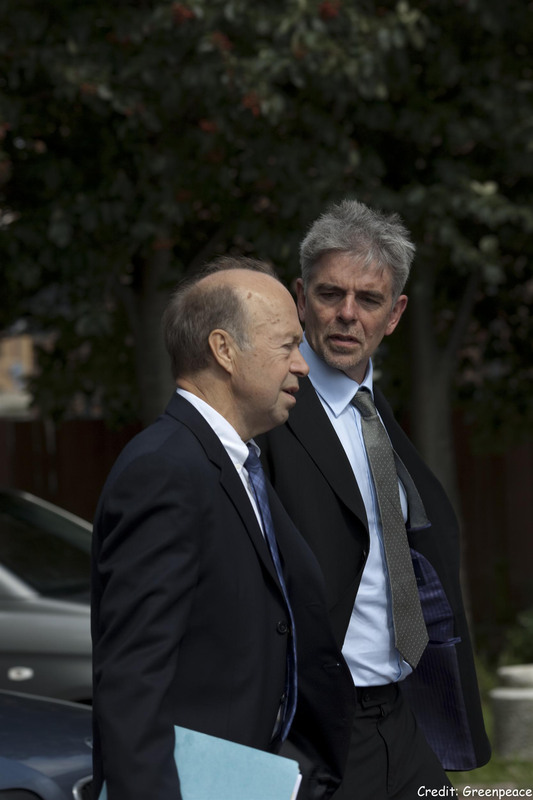 Jim Hansen, expert climate witness in the trial of protestors who disrupted the operation of the Kingsnorth coal burning power station talking to John Sauven, Executive Director of Greenpeace in the UK, at the trial at Maidstone Crown Court. Image credit: Greenpeace. By providing evidence for use in legal cases Jim could also fight increasing greenhouse gases directly. Though his attempts to do so for the Marshalltown coal-burning power plant, near his hometown of Denison, Iowa, in 2007 and 2008 would be unsuccessful other efforts would fare better. In 2008 he testified in the defence of six Greenpeace activists who’d disrupted the operation of the UK’s Kingsnorth coal power plant. The jury acquitted them on the grounds that their actions were justified because they were preventing greater damage in the future. And in April 2009, Jim, Steve Schneider and three other scientists would comment in support of California’s desire to make vehicles more efficient. The US Environmental Protection Agency (EPA) had blocked the state’s law, even though vehicles accounted for two-fifths of the state’s CO2 emissions. By June, with Barack Obama now president, not only did the EPA let California pass its law, but it directed the rest of the country to follow it. Then, on June 23, 2009, Jim and around 30 others were arrested for obstructing traffic outside the Coal River Mountain, Virginia, facility of Massey Energy. They were protesting against the company’s plans, which included blowing up the mountain to get its coal out. For some pushing for action on climate change, Jim’s brave, strident stance has been too much. 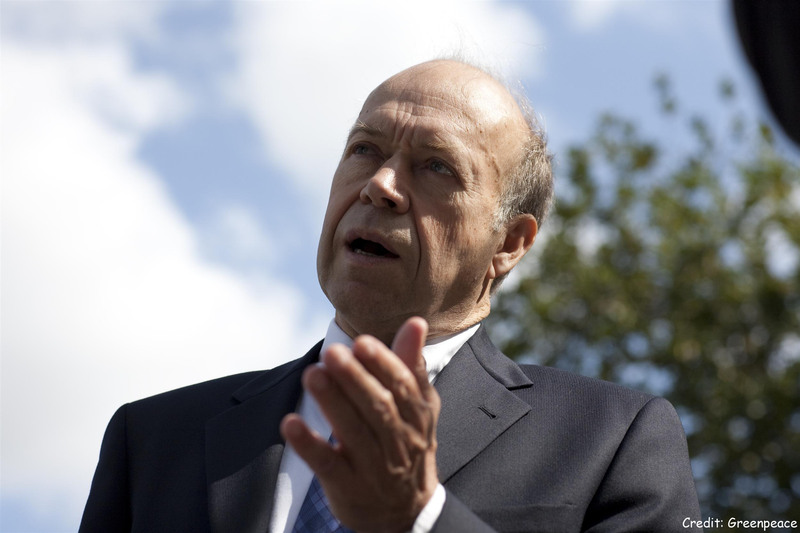 Days after he was arrested, the US congress passed a law – known as the Waxman-Markey Bill – to establish an emissions trading scheme like Europe’s. Sceptical of its effectiveness, he opposed it, irking longtime supporters who saw it as the country’s only political possibility for climate action. That was bad criticism, Jim told me. “Yesterday’s impossible can be tomorrow’s reality,” he said. “It needs to be.” The following year, the bill failed to get the Senate approval it needed, which Jim says was a good thing. “It was dishonest, pretending that energy prices would not go up much,” he said. 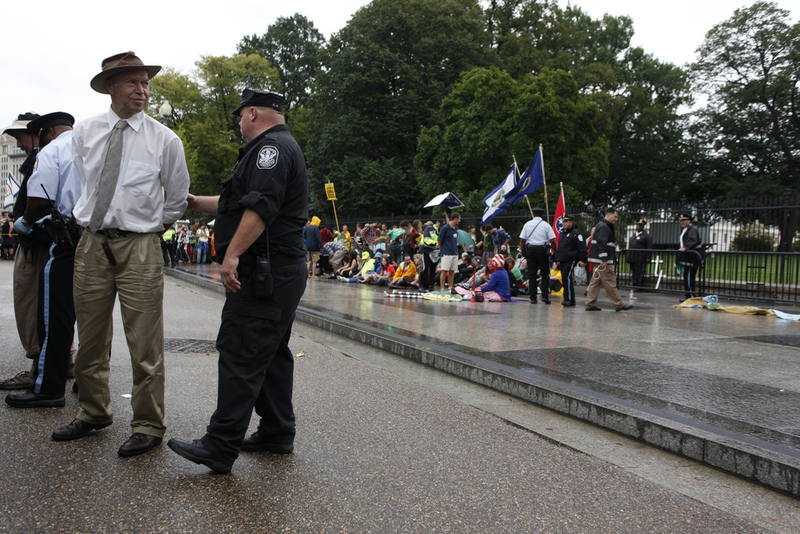 Jim Hansen was arrested in September 2010 alongside over 100 Appalachian residents and retired coal miners calling for abolition of mountaintop mining and immediate veto of the Spruce strip mining project in West Virginia. Image credit Rich Clement, used via Flickr Creative Commons License. By the time it was clear the bill had failed, Jim had been through an operation for prostate cancer and turned 69. While many might have had enough by that point, Jim instead has become more active in fighting climate change. He feels what he’s learned obliges him to act, and hopes more follow his example. “I’m old enough that I can afford the distraction from science, and my research pretty much covered the most relevant topics,” he told me. Laid up for weeks recuperating following the operation and the complications that followed, Jim wrote all day, eventually producing the book “Storms of My Grandchildren”. He then returned to his job at GISS and continued his battle against fossil fuels, using vacation time to take part in protests, often getting arrested. For example, in August 2011, he was one of 140 arrested protesting against the Keystone XL pipeline, which he calls the “fuse to the biggest carbon bomb on the planet”. After 46 years at GISS, Jim’s arrests would contribute to his retirement in April 2013. “It was becoming clear that there were people in NASA who would be much happier if the ‘sideshow’ would exit,” he told New York Times reporter Justin Gillis. But he still continues his research at Columbia University, where he’s even busier than before. “I also must do fundraising to support the three people working with me – it’s time consuming,” he said. Jim’s recent work includes helping young people across the US suing government agencies for failing to develop a climate change recovery plan. In December 2013 he and ten other leading scientists published a paper that supports the case, highlighting governments are failing to protect young people’s rights. The long legal process of filing and counter-filing is ongoing even now. Jim told me he’s also currently working on an important paper concerning ice melt, sea level rise and increasing storm intensity. I’ve already written about the following pivotal climate scientists who came before Jim Hansen, or were around at the same time: Svante Arrhenius, Milutin Milanković, Guy Callendar part I, Guy Callendar part II, Hans Suess, Willi Dansgaard, Dave Keeling part I, Dave Keeling part II, Wally Broecker part I, Wally Broecker part II, Bert Bolin part I, Bert Bolin part II, Suki Manabe part I, Suki Manabe part II, Steve Schneider part I, Steve Schneider part II, Steve Schneider part III, Jim Hansen part I, Jim Hansen part II. I got most of the information for this blog entry from Jim Hansen’s book, ‘Storms of my Grandchildren’. 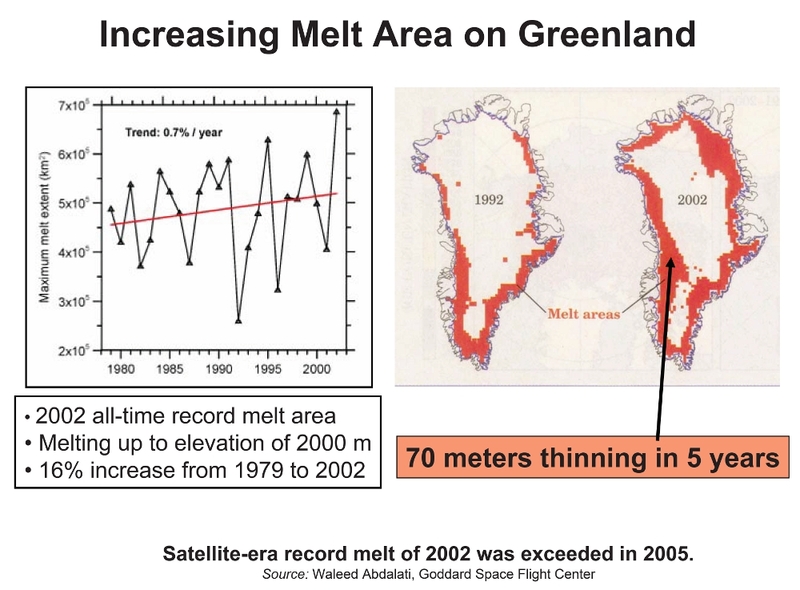 http://nsidc.org/greenland-today/ shows the current situation compared to previous years in Greenland. 2012 looks to have had very high melting; 2009 and 2013 very low. This has been an informative series. Thank you for highlighting his life and work. We are proud to call him a fellow Iowan. My thoughts on this include what I have written on the June 1 post at http://my.rsc.org/blogs/84. Essentially, I believe that in practice we are not going to shut down burning fossil fuels, so the only way out of this problem will involve some serious geoengineering, as well as a massive shift from fossil fuel burning.